Today (May 19th, 2014): top 10 world’s most exclusive ultra-luxury hotel chains & their flagship hotels. For most, it’s purely aspirational (unless you read my tips for getting the best hotel deals). For some, it is a once in a lifetime experience. For a select few, it is a quest: discerning the subtly nuanced variations in service levels that separate the great from the exemplary. Every frequent traveler has had the conversation with friends or colleagues: what luxury hotel chain is really the best? It’s a personal decision and its often a tough call. There may be favorite hotels for business, with other resorts being considered for romantic getaways. Here is my top 10 list of the world’s best ultra-luxury hotel brands. There is more info below my Youtube compilation & slideshow. For an extended list of the 44 top luxury hotel brands in the world, click here. Think I missed one? Share your favorite luxury hotel brand in the comments section, or take my poll below! Located in major gateway cities and prime leisure travel destinations worldwide, Park Hyatt luxury hotels impress guests with an atmosphere of easy elegance and discreet service. Each Park Hyatt is designed to reflect the unique character of its locale – the chic of Paris, the exotic allure of the Maldives or the all-American style of Chicago. Park Hyatt hotels are known for acclaimed art programs, high-end interior design and furniture, and award-winning restaurants under the direction of celebrated chefs. Guests are affluent professionals, dignitaries and celebrities who truly understand the art of the journey, have discerning taste and appreciate gracious service. The Park Hyatt portfolio is expanding rapidly, with several highly anticipated hotel openings in the pipeline. Flagship hotel: Park Hyatt New York, USA. This hotel features in my top 10 lists of the best luxury hotels in New York City and the most stunning indoor hotel pools in the world. Click here to read my review of the Park Hyatt New York. My favorite hotel: Park Hyatt Sydney, Australia. This hotel features in my top 10 lists of the world’s most spectacular hotel rooftops, the best luxury hotels in Australia, the world’s best hotels, and hotels loved by celebrities. Click here to read my review of the Park Hyatt Sydney. The Peninsula Hotels group has a unique identity among the world’s leading hotels. Established in 1928, the group now operate prestigious luxury properties in 10 major cities. These include the flagship in Hong Kong, plus Shanghai, Tokyo, Beijing, New York, Chicago, Beverly Hills, Bangkok, Manila and Paris; the London property is under development. Peninsula is a living legend, the name synonymous with luxurious comfort and impeccable service. The Peninsula Hotels group sets their sights high and their standards higher, aiming always to delight their customers, and in many cases they are now serving the third generation of their loyal guests. Official website: The Peninsula Hotels. Flagship hotel: The Peninsula Hong Kong, China. My favorite hotel: The Peninsula Shanghai, China. This hotel features in my top 10 lists of the best luxury hotels in China and the best luxury hotels in Shanghai. Click here to read my review of The Peninsula Shanghai. Created exclusively for the luxury resort market, One&Only resorts are conceived as hallmarks of excellence. This exquisite collection of award-winning properties features some of the highest-rated resorts in the most idyllic spots in the world. Each resort in the One&Only collection not only offers unique design and ambiance which embraces the local surroundings, but also an unparalleled commitment to the finest experience on every possible level. Luxurious accommodation is complemented by personalised and friendly service, award-winning spas, lively entertainment and a host of activities, as well as unforgettable culinary adventures from some of the world’s most accomplished chefs. One&Only signature restaurants include Jean-Georges Vongerichten’s Dune restaurant at One&Only Ocean Club and Alain Ducasse’s Spoon des Iles at One&Only Le Saint Géran. Flagship & my favorite hotel: One&Only Reethi Rah, Maldives. This resort features in my top 10 lists of the best resorts in the Maldives, the world’s best hotel beaches, the world’s best hotel spas, and luxury hotels loved by celebrities. Click here to read my review of One&Only Reethi Rah. In days gone by, merchants would gather under the leafy branches of a banyan tree to conduct business in the cooling shade. Over time, this unique tree has come to symbolise the relief and shelter provided by nature to all men and women. Today, it is also the name of a special group of ultra-luxury hotels that stretches across the globe and offers rest and relaxation to the world-weary. With attentive, yet discreet staff, Banyan Tree Hotels and Resorts provide naturally luxurious, ecologically sensitive, culture-aware experiences for the discerning, responsible traveller. They are quite simply the way things should be. The philosophy behind the hotels, resorts, residences, spas, retail galleries and destination club is based on rejuvenation of the body, mind and soul – a Sanctuary for the Senses. Official website: Banyan Tree Hotels & Resorts. Flagship hotel: Banyan Tree Phuket, Thailand. This resort also features in my top 10 lists of the Phuket’s best ultra luxury resorts and the best luxury hotels in Thailand. To read my review of the Banyan Tree Phuket, click here. 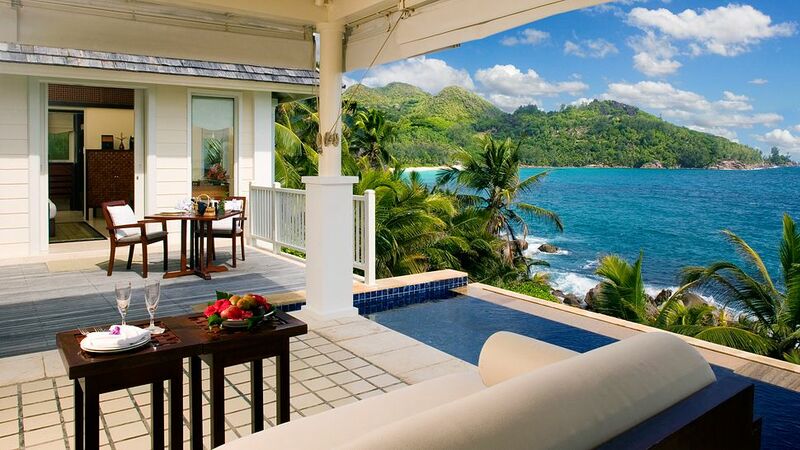 My favorite hotel: Banyan Tree Seychelles. This resort features in my top 10 lists of the best luxury hotels in the Seychelles, the world’s most beautiful hotel beaches, and the most world’s most spectacular views from hotel rooms. To read my review of the Banyan Tree Seychelles, click here. Mandarin Oriental Hotel Group is an international hotel investment and management group with deluxe and first class hotels, resorts and residences in sought-after destinations around the world. The group has grown from a well-respected Asian hotel company into a global brand and now operates, or has under development, more than 40 hotels. Mandarin Oriental is recognized widely as one of the best global luxury hotel group, providing 21st century luxury with oriental charm in each of its hotels. Above all, Mandarin Oriental is renowned for creating unique hotels through distinctive design and a strong sense of place, luxury hotels right for their time and place. The Group regularly receives international recognition and awards for quality management and legendary service hospitality. Flagship hotel: Mandarin Oriental Hong Kong, China. My favorite hotel: Mandarin Oriental New York, USA. This hotel features in my top 10 lists of the best luxury hotels in New York City and the world’s most luxurious, large city hotels. COMO Hotels and Resorts is an international hotel group based in Singapore. The group currently operates a small portfolio of ultra-luxurious properties in London, Bangkok, the Turks and Caicos islands, the Maldives, Miami, Phuket, Bhutan, and Bali. COMO Hotels and Resorts was founded in 1991 by Christina Ong, who was listed as one of Asia’s 50 Power Business Women by Forbes in 2012. COMO Hotels and Resorts creates personalised luxury travel experiences highlighting wellness, cuisine, adventure and culture, service and design, while always trying to uphold a strong, sustainable approach towards the people and places where the group operates. The company also manages the sister brand in wellness, COMO Shambhala, which promotes health, relaxation and learning through its products, services, cuisine, treatments and spa facilities within each COMO property. Official website: COMO Hotels & Resorts. 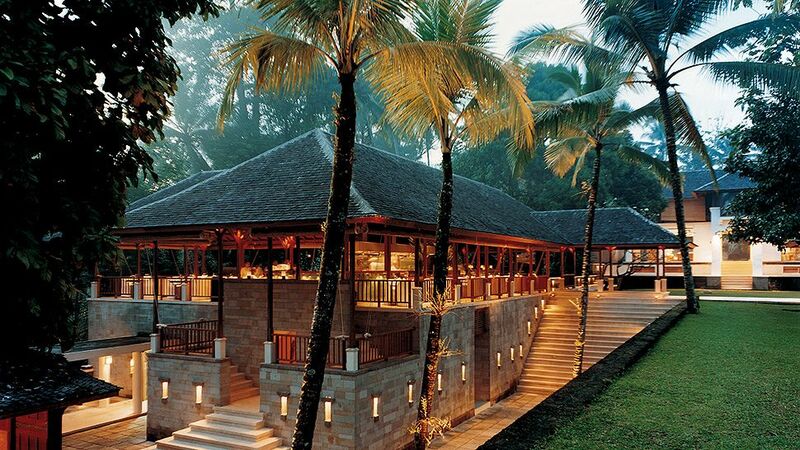 Flagship hotel: COMO Shambhala Estate, Bali, Indonesia. This resort also features in my top 10 lists of the best luxury hotels in Bali, the world’s most beautiful hotel pools, the world’s best rainforest lodges, and the best spas in the world. To read my review of COMO Shambhala Estate, click here. My favorite hotel: Maalifushi by COMO. This resort features in my list of the best new luxury resorts of 2014 and my top 10 lists of the best luxury resorts in the Maldives and the most amazing beach hotels in the world. To read my review of Maalifushi by COMO, click here. Founded in 1979 in Dallas, Texas, USA, Rosewood manages one-of-a-kind luxury properties in the world’s most desired destinations. Rosewood properties embrace the company’s “Sense of Place” philosophy, reflecting the history, architecture, scale and sensibilities of the destination. The Rosewood collection includes some of the most legendary hotels and resorts in the world. Rosewood also offers Sense spa, featuring treatments reflective of the location’s culture and natural environment, available exclusively at select properties. Rosewood is widely regarded as a leading ultra-luxury hotel company whose portfolio includes both contemporary classics and historic properties such as Rosewood London and The Carlyle, the quintessential New York hotel. Flagship hotel: Rosewood Mansion on Turtle Creek, Dallas, USA. 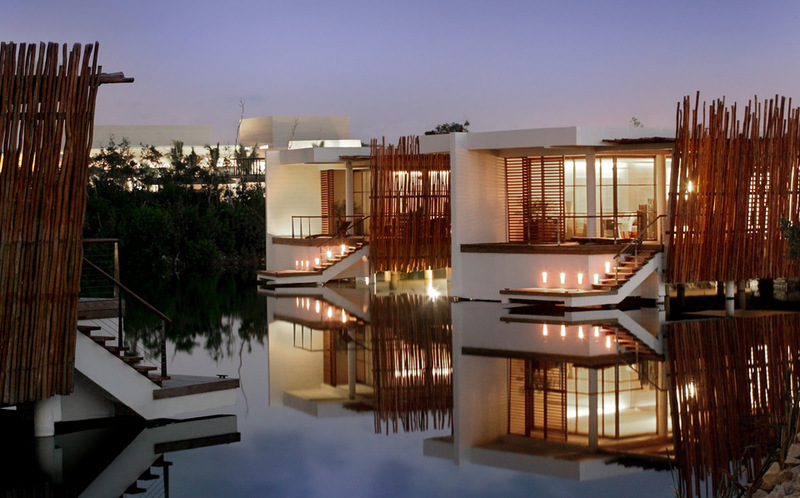 My favorite hotel: Rosewood Mayakoba, Riviera Maya, Mexico. This resort features in my top 10 list of the world’s best hotel rooms with private plunge pools. Born of a distinctive legacy and crafted for modern connoisseurs who desire the finest experiences imaginable, the St. Regis brand established luxury hospitality with the opening of The St. Regis New York more than 100 years ago. From the moment John Jacob Astor IV opened the doors of his Beaux-Arts masterpiece on New York’s Fifth Avenue, St. Regis (now part of the Starwood hotels) has stood as a symbol of uncompromising elegance and bespoke service. St. Regis Butler Service has been a signature of the St. Regis experience for more than a century, and S Regis remains the only luxury hospitality brand to offer this personalized service at every one of their hotels around the world. Combining classic sophistication with a modern sensibility, the St. Regis brand is committed to delivering exceptional experiences at over 30 of the best addresses around the world. Flagship hotel: St Regis New York, USA. My favorite hotel: St Regis Le Morne, Mauritius. This resort features in my top 10 lists of the best luxury resorts in Mauritius, the best hotels for amazing award redemptions, and the best health spas in the world. To read my review of the St Regis Mauritius, click here. Four Seasons Hotels and Resorts is one of the world’s leading ultra-luxury hotel brands, with almost 100 properties in more than 40 countries. The hotel group is rapidly expanding globally, with dozens of hotel projects in development. Four Seasons is based in Toronto, Canada. It was founded in 1960 by Isadore Sharp, whose family is still prominent in Four Seasons. Sharp’s first luxury hotel was the Four Seasons London, which opened in 1970. The company went public in 1986. Some Four Seasons Hotels are fully owned by the brand, but it acts as a management company for many of its properties. In addition, Four Seasons owns residential properties in resort areas. In 2013, the Four Seasons hotel Toronto was opened, the haute brand’s new flagship. Flagship hotel: Four Seasons Toronto, Canada. 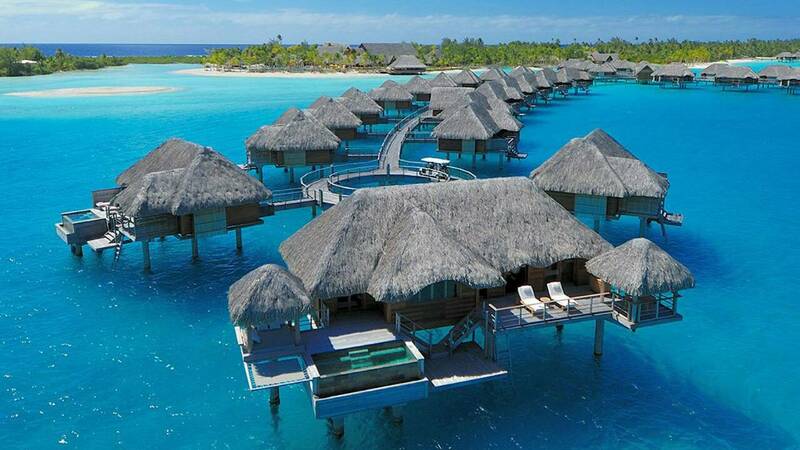 My favorite hotel: Four Seasons Bora Bora, French Polynesia. This resort features in my top 10 list of hotel rooms with the best view. Aman is one of the iconic brands to have emerged from Asia. Widely acclaimed as the most luxurious hotel brand in the world, Aman is known for ultra premium service and luxury, high-profile clientele and the most exotic locations. True to the meaning of its name – Aman means peace in Sanskrit – Aman has built up a reputation of providing a divine and peaceful experience by maintaining exclusivity and being totally discreet about its clients, among them many famous celebrities. Since 1988, when flagship Amanpuri opened in Phuket, Thailand, Aman has established resorts in Bhutan, Cambodia, China, France, Greece, India, Indonesia, Italy, Laos, Montenegro, Morocco, the Philippines, Sri Lanka, Turkey, the Turks and Caicos Islands, the United States of America, Japan and Vietnam. Flagship hotel: Amanpuri, Phuket, Thailand. This resort also features in my top 10 lists of the best luxury hotels in Thailand and Phuket’s best ultra luxury resorts. Read here my review of Amanpuri. My favorite hotel: Amanoi, Vietnam. This resort features in my top 10 lists of the most fabulous luxury hotels in Vietnam, the most astonishing beach retreats in Asia, the best things to see and do in Vietnam, and my favorite Aman resorts in the world. Read here my review of Amanoi. Nice post – what are YOUR favorite hotels? I have a little predilection to the Park Hyatt especially the one in Tokyo where I spend a few nights in november ! I will be staying at the Park Hyatt Tokyo in May! just keep the service and quality to be good, well done.